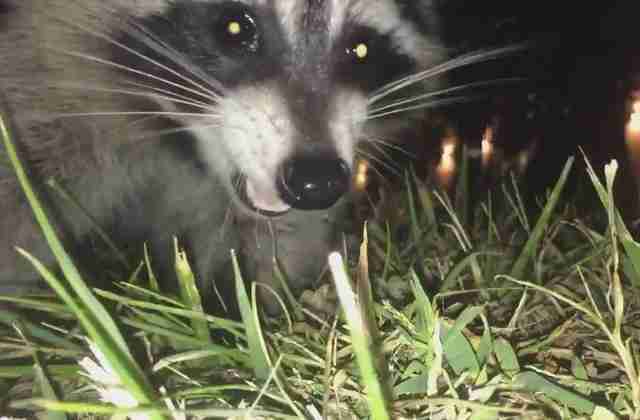 Guy Williams got more than he bargained for while trying to take video of a handsome local raccoon - but there's no denying that the footage is far better off because of it. One evening this week, 19-year-old Williams spotted the masked animal making the rounds on the campus of Bellarmine University, in Kentucky. Thinking it would be interesting to get some up-close footage of the little guy, whom he named Stanley, Williams set his phone to record and placed it in the grass, luring him closer with some tasty acorns. Turns out, however, that Stanly was more interested in the free phone - which he picked up and used to film his own getaway. Naturally, this isn't quite what Williams had in mind. In another video, shot by his friend, we see the hapless would-be nature photographer in desperate pursuit of his subject. This round goes to Stanley. Fortunately, as Williams later tweeted, Stanley eventually decided to ditch the stolen device, so he was able to recover the footage that was recorded - and it's a good thing that he did. Since posting the clip to Twitter, it's already been retweeted nearly 40,000 times. Not bad for a raccoon's first film.